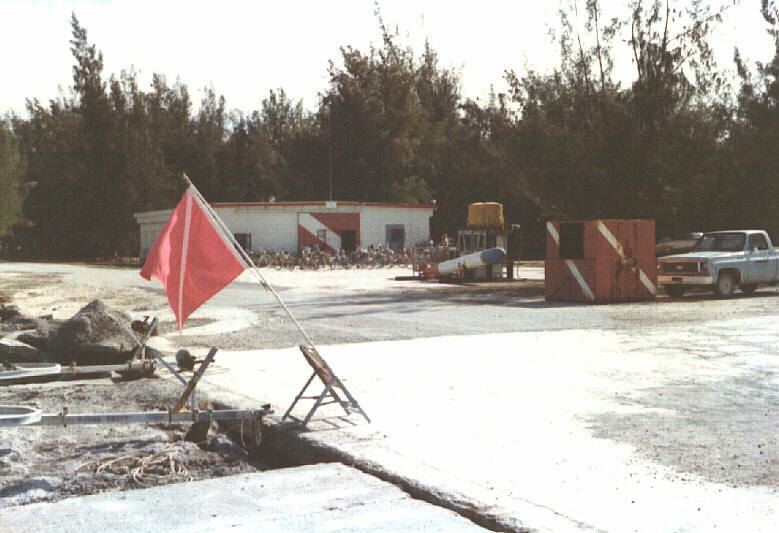 In Early 1959, having volunteered for a tour of duty on an island referred to as Naval Air Station 3080; I arrived on Midway Island. My goad was a selfish one. I had enlisted in the Navy to do anything underwater. When boot camp was over, at Great Lakes, my entire company received orders to various Naval Air Training Centers. I knew that along with every island comes water – underwater. I could work out the diving. 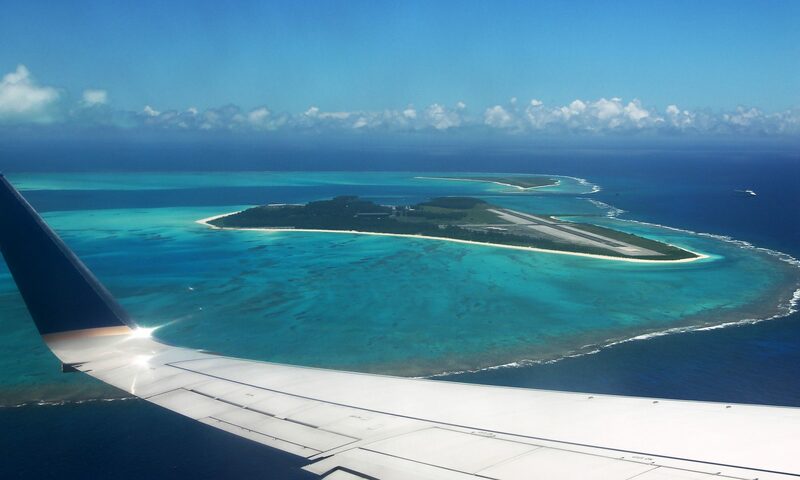 As we flew in over the reef there was no longer any question. I guess the first thing I did after checking in and stowing my gear was to begin looking for all of the divers. There were 3. As luck would have it, I ran into one of those guys who know every single thing that is going on every where and he, a non-diver, knew those 3. At our first meeting, there were discussing a “more formal” organization of a dive club. I was made right at home, I don’t recall whether Dale and Margie Lemly were already there or arrived later. At this point the future, more formal “Koral Kings of Midway Island” had six members. I do not recall the names of two of the first three, but one was named Perry. Another, whose name may have been Knudson, who was a dental technician under Captain King and the third, Thomas Itoney, he was a teletype repairman. During our next couple of weeks we dove a lot and worked on a set of by-laws for the club, decided on the name and began designing patches. When the by-laws were signed, it was decided by all, that the three I first met would be the only actual charter members. The rest of us would become the first member. 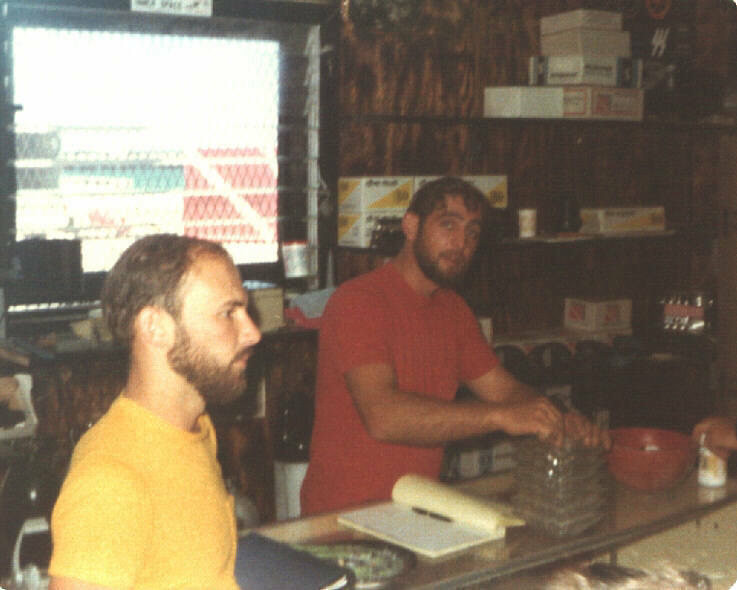 During the fourteen months I would be on Midway, Tom and I became the type of diving buddies that worked so well; we automatically knew which way the other was turning without watching. We even looked alike. He was about 6’, trim, with tight dark brown hair. I was about 5’6” and somewhat paunchy. 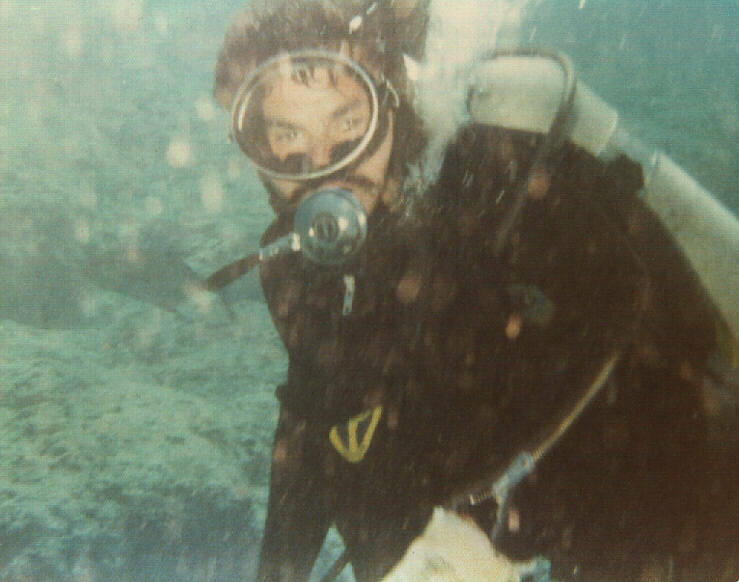 During those days, we were not allowed to use scuba gear but became rather proficient breath-hold divers. I could never reach the depth that Tom could, but 60-70 feet didn’t seem to bad for a working dive. We were in the water just about every day. I recall one day when I was playing with a school of bat rays, just over the small reef. Members of a UDT Team came out like jet skis to save me from what they thought to be sharks. We had trouble getting to the big reef; it was a hell of a swim. Special services had some small outboards, but none were much good. One had some holes punched in it and we made a deal to get it for club use if we repaired it. 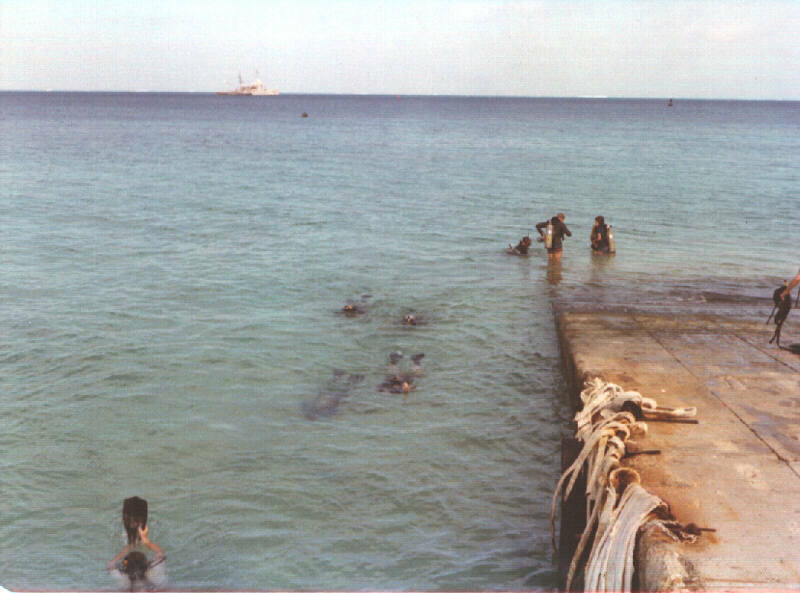 The big reef was at our doorstep and became a regular dive site when we had days off duty. The patches came in and the club was moving at a just right pace. We were listed in skin-diver magazine (’59 & ’60). To this point we made no night dives. Perry noticed an ad for some special u/w lights. They were supposedly to be special design. As I recall, they were just under $20 each. Of course we ordered them. They arrived and turned out to be only a standard bulb and handle that could be mounted on a 6-volt dry cell. We planned the first dive for the small reef, were in the water about midnight and spent some three hours swimming back and forth along the reef. We cam out of the water sometime about 0300 to be faced with base security, under arms. 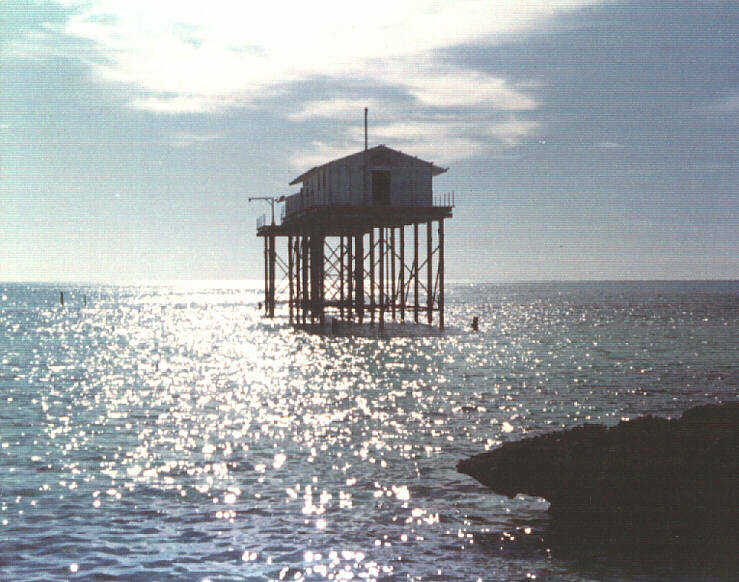 It seems that strange lights were seen, “moving along the reef”, from the tower. It took a while to explain this. Of greater importance was the fact that the lights only lasted about that long and started going out. We went out with six and came back with 2 going dim. On another occasion, we had been seeing an influx of sharks along the outboard side of the small reef and I wanted to get some pictures. I made a u/w housing out of Plexiglas, we picked a great day, I swam out to the reef while the others were fixing some lunch on shore, I went over the reef and looked around a bit. The wave surge was pretty bad so I decided to take a position on the reef where I could lock myself in, letting the waves break over me. The cycle was the big wave would break every fifth. That’s when I would get the shot. I found just the right hole and as the wave approached, went under and braced in. there were a couple of sharks right there, as the water began to rise. I don’t recall snapping the picture before I was swept out of my little hole, slammed and drove across the coral. When I came to the surface, on the inward side of the reef, the camera, on fin, my mask and snorkel were gone. As I swam toward shore using one arm, I could see the trail of blood (even without my mask) behind me. Everyone on shore saw the one-armed crawl and thought I was hauling something back in, they were right. There was one other time when we were headed out to the 3-mile reef in the club-repaired boat. I believe the outboards we used were 25hp, so we were “sort of “ cruising along. A fairly large thrasher shark was headed right toward us. As he came along side Tom Itoney grabbed his mask and jumped on his back. Man! Could that guy hold his breath? He disappeared for what seemed to be ten minutes and then pop up somewhere and we’d head for that spot. This went on for I don’t know how long and all of a sudden he came to the surface hollering for us. We raced to him only to find him hauling the five-foot thrasher. He had done the shark with his dive knife and we loaded both into the boat. I don’t know if he still has the jaw bone trophy, but he sure worked hard for it. This was a rare situation because all members were very careful to only take sea life that we were going to eat. 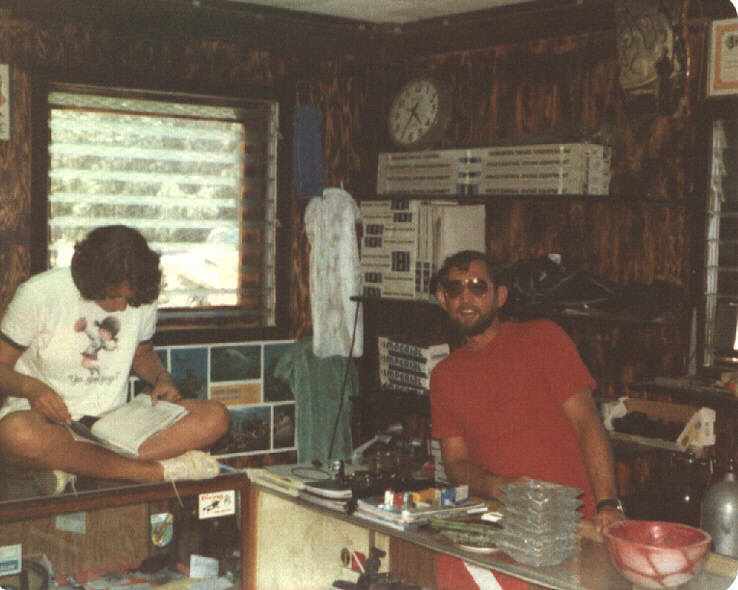 I remember another time when just Tom and I were off the outboard side of the reef, we were just on a shell hunt, but we were looking for the big conus litterus cones under the deeper coral heads. We were taking alternate breath-hold to about 60-80 feet and it was his turn while I stayed on the surface. He looked about six inches long as I watched him look around on of the corals and finally reach under. All at once he jerked back and out came his hand full of moray eel. As he raced for the surface he fought to cut it off. He was about half way up when the eel dropped off and too most of his meat with it. We got him in the boat; his hand was a mess. We didn’t have the first aid kit. We had a couple of tee shirts and wrapped it up in those and raced the old 25-hp engine for the shore. Boy, you can do a lot of bleeding in a 3-mile boat ride. That put him out of service for a few weeks. He always wanted to go back after that cone shell but never did. Koral Kings Divers at the seaplane ramp, most likely lessons. There were others that joined the club over the months. I recall a chief petty officer and believe his name to have been Ernie Tougas. There was one other chief whose name I can’t recall, it seems that it might have been Keith, and a civilian teacher named Bob Smith. Then there was a young fellow and I recall his name to be George Skeels. This guy was something, one of the luckiest to be in the right place, right time, guys I knew. If we were out diving he would be the one to see the giant sea turtle or some special event underwater. By the time we got there it was gone or just swimming off, out of sight. One day though we were right on hand, he saw a coral head that looked like a mushroom. He was looking it over when the others swam up. It backed off and went in to report it to the EOD. A few days later they came out and shot it with a rifle. She blew a column of water about 250 feet into the air. There was a picture of the explosion but I don’t believe the club got a copy. 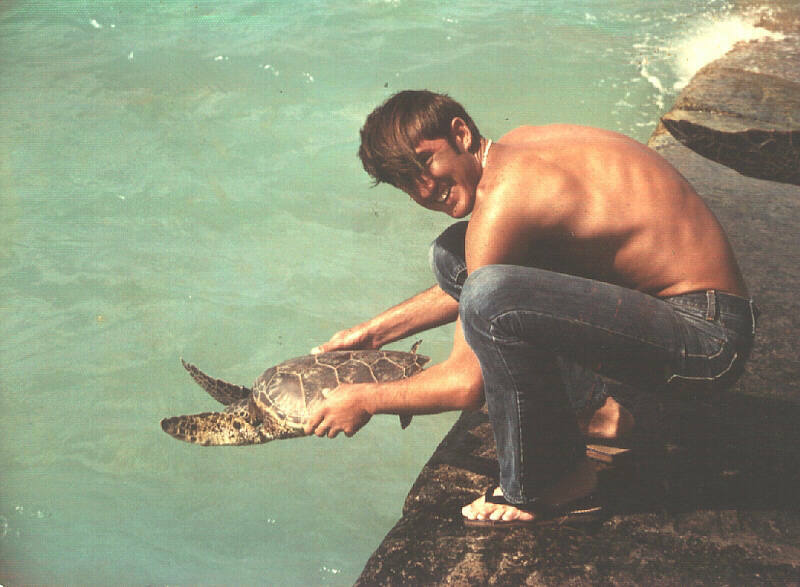 Koral Kings tagging turtles at Midway Island. We were always pressing to develop the club and one of the problems we had was finding a place to work on our gear. We were given permission to take over one of the old Quonset huts down beyond the barracks area. It didn’t take us long to set that place up. We would work in there at all hours. We were headed into the colder months and decided to make some wet suits. Back then you would order single skin sheet material and cut out your own. We wasted some of the rubber becoming tailors and even then we ended up with tight spots and baggy bulges, but we finally got things together. They sure were a step up when the temperature changed. Certainly, there are so many things to tell and possibly others may be stimulated to submit recollections and corrections to this entry. I was the first of our group to be shipped out to Barbers Point. I would like to close this with recollections of two whom became very dear friends, Margie and Dale. We have remained in touch, but never been able to get back together. It was always great fun to have these two show up at the beach. 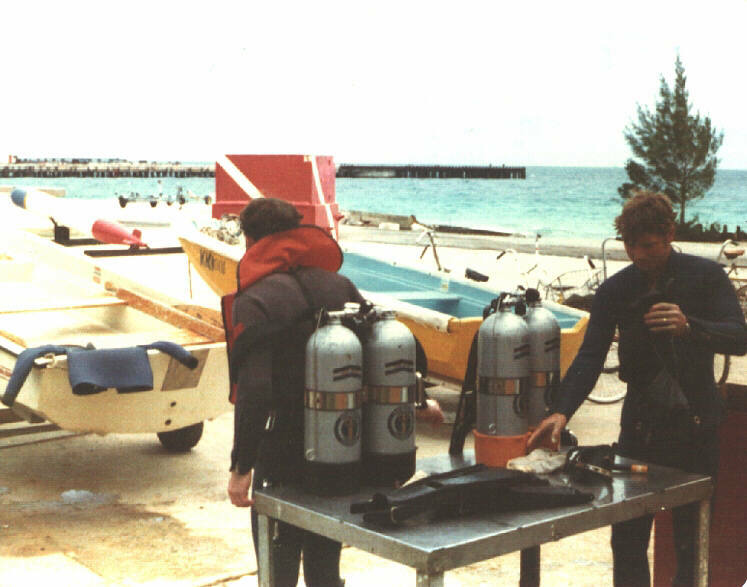 As I recall, they only got out to the big reef a couple of times, but the outboard side of the small reef became a club rendezvous area. Margie was just full of sunlight and spirit and Dale always brought with him his own special humor that would make even the worst day worth being there. I am sure that every member carries special memories of this couple. 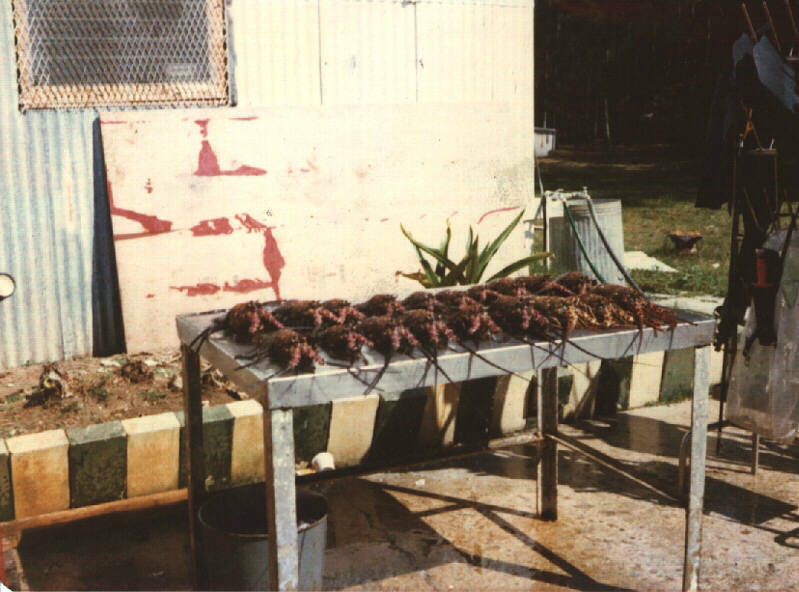 There were a few occasions when we would make an early night dive and show up at their quarters for the teriyaki. These were special times. I was the first of the member to be transferred out for duty at Barbers Point. I recall that all of the members showed up to see me off and how very difficult it was to leave. You think you will be able to stay in touch, but more often you can’t. I’m still a very active diver, have taught u/w archaeology and sail, as a crewmember on a tall ship. Over the years, I have forgotten some of the names, but I never look at the old netted fish ball, or the triton trumpet from Midway that I do not revisit the fondest memories from Navy 3080, with a tightened throat.